New Sleigh Bells song: “Born to Lose.” | I blog for real, y'all bloggers are Sam Bowie. 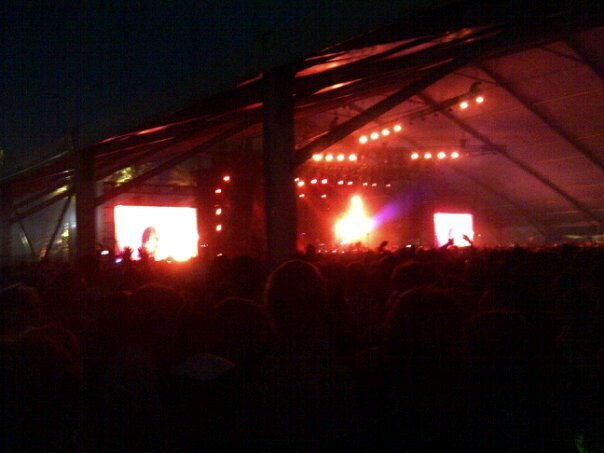 I had never heard of Sleigh Bells until I went to Coachella this last April. The crew I was with was adamant about seeing them live, so I obliged. Long story short, their show ended up being one of the highlights of my experience there. Their blend of pop, metal, hip-hop and electro paired with grandiose aggressiveness appeals to my music taste to the highest degree. Their music is nearly impossible to classify, but it’s raucous, powerful and absolutely LOUD! Needless to say, their album Treats gets plenty of play on my iPod. Derek Miller (guitarist, producer) didn’t lie when he said the band would be abandoning their “noise pop” feel. “Born to Lose,” the duo’s lead single, released today, is a perfect example of it. My opinion; not my cup of tea. I wanted something that was going to tear my face off & blow out my ear drums. Neither happened. I guess I was expecting something harder – more ferocious, but I understand the appeal this song will have to others. I’m still very excited for Reign of Terror, especially to hear the progression and new direction Sleigh Bells wants to take. However, do they have the capability to make another album as groundbreaking and multifaceted? Hopefully this one song isn’t a summation for what the rest of the project has to offer. ← When I come back like Jordan, wearing the 4-5.
more of your excellent work. By the way, how can we communicate?